In early April 2019, I sent this email to Brian Bingham, editor of Automatic Pilot. Thanks for your prompt response. Would you be able to call in tomorrow morning at 12noon? I am interested in promoting poetry and creative writing so we could have a chat about compiling a pre-recorded programme (or a series of short programmes) based on the publications. To do this we would require contributors to come in to the studio and record or if they had access to a laptop and mic they could email in their recordings. I would be happy to present and edit the programme so it would be available for podcast. It was great to meet you this morning and to chat about the opportunities for Automatic Pilot contributors to record their poems, say something about themselves and to choose a song for inclusion in a Radio Show for Dundalk’s Community Radio Station. The show could be subsequently uploaded and shared. Let’s hope the idea takes off and we have a show on air before the summer!. Here is a link to a Wikihow page that explains how you can record using your mobile and share the recording, which is usually by email. Brian liked the idea and said he would email the contributors. You’ve all been invited by the manager of Dundalk FM, who has a great interest in promoting literature, to broadcast poetry or literature of any style, theme, and volume on Dundalk FM. If you’re interested please send your broadcast which you can record on a smart phone and email to me. If you’re unsure of how to record, Here is a link to a Wikihow page that explains how you can record using your mobile and send the recording by email. 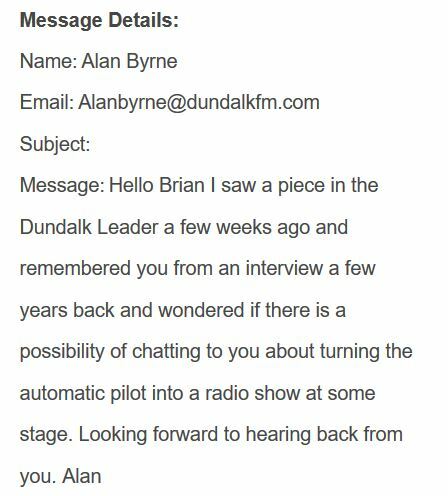 If you can also include in the recording an introduction of yourself before your reading, and then finally choose a song for inclusion on Dundalk’s Community Radio Station. Dundalk FM are hoping to broadcast the readings as a regular show by the summer. If you’ve any questions please contact me at your convenience. If you’ve submitted recently to Automatic Pilot will be in contact in June with my decision. Hoping you’ll all consider Automatic Pilot for future submissions. And so Automatic Pilot recitals commenced with Ceinwen’s contribution.